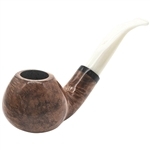 Billiard with Silver and White Trim Rings Colton German Briar Pipe - One of a kind, the distinctive silver and white trim rings offers a classy look on this Colton briar pipe. Colton pipes are Made in Germany of high quality German briar with Germany stamped on the pipe shank. The Vulcanite black stem gives long lasting durability and complements the wood graining. Colton pipes come in a Colton velvet drawstring pouch.